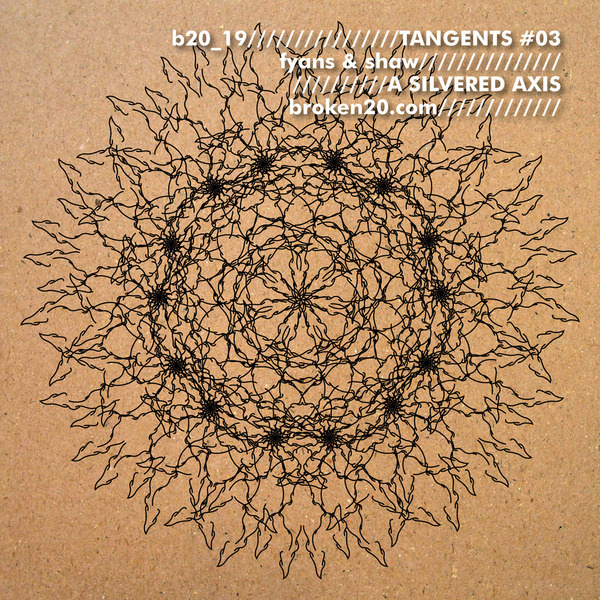 “Broken20’s CD-r series ‘Tangents’ continues with a collaboration between the label’s art director Dave Fyans aka Erstlaub and fellow traveler Norman Shaw, entitled ‘A Silvered Axis’. Prior ‘Tangents’ releases have been collaborative in one of two broad ways: concurrent live performance or, in the case of TVO and Andrew Sharpley’s recent sonico-political pamphlet ‘CBK Robots’, a more standard studio collaboration, albeit one conducted remotely. ‘A Silvered Axis’ falls between these stools, an experiment in concurrently linear collaboration which, while not a live collaboration as such, was melded so that each iteration towards the finished product was a continuous hour long performance, reacting to a fixed point in space/time. Fyans explains: “I recorded an hour long treatment of the Loch Tay Boat Song using my modular system, which was sent to Norman to perform around as he saw fit. On being sent Norman’s subsequent recordings, I then stripped out the original material and undertook an additional hour long performance mixing, treating and coalescing the created response into the finished workings”. What emerges is an arresting piece that speaks as much of Shaw’s treacly metal experiments as it does of their shared interest in Enochian industrial drone. The extended first passage delves so far into churning depths that sounds of nature, strings and voices emerge like spectres, sirens or hallucinated memories. At twenty-five minutes, shards of light are scattered across the surface, and the work as a whole begins its torpid awakening. Harmonic layers are applied like coats of paint, generating lustre, obscuring or occluding their base. After time, dissonant strains burrow through like woodworm and gasp for breath, then feed, and grow, and decouple. Our perspective seems to follow as these clashing tonalities finally develop wings and take flight into the treble’s stratosphere, leaving the original drone body spent, scuttled, meekly corporeal.